S incerely Yogurt was founded on passions for delicious and healthy frozen treats, giving back to the community, and for spreading awareness on healthy snacking. It is our promise that Sincerely Yogurt will never compromise the quality and strict standards we set in stone from our very first location. We invite you to explore the brand with us, and see why we are a step above the rest of the market. We are a self-serve frozen yogurt chain based in Pittsburgh, PA. Sincerely Yogurt offers high quality frozen yogurt, smoothies, and allergen-friendly treats. With a community focus and a passion for health-conscious eating habits, we have grown to 12 locations with many more in the works. As we expand, we are committed to partnering with future franchisees who share our passion for clean eating and conducting business with the highest ethical standards. Our high standards and attention to detail set us apart from other frozen yogurt stores. We focus on the health benefits of our products, and continually update them to cater to our varitey of customers. Besides ultra-healthy frozen yogurts, we offer a full line of meal-replacement smoothies. They come equipped with supplement boosters for added nutrition, and can be modified for dairy and gluten sensitive customers. Frozen yogurt has always been a guilt-free option to ice cream with fewer calories and more nutrients per serving. Tart-flavored or Greek frozen yogurt, a menu offering in our frozen yogurt shops, is taking the frozen treat industry by storm. Its health appeal with low to no sugar content and naturally occurring probiotics has mass appeal with a health-conscious America looking for food with fewer preservatives and less sugar. The frozen yogurt and smoothie industry has grown widely across the US despite the 2009 recession. Industry revenue has risen at an annual rate of 5.8% and is forecasted to grow to $2.7 billion in 2021 - and is worth over $700 million! Demand driven by increasing health-conscious customers and parents have propelled the industry as a low cost healthy indulgence. Health concerns have driven the growth of self serve style stores, since they allow for portion control on an individual basis. Additionally, customers can customize their frozen treats and choose to add as many healthy toppings as they would like to. Sincerely Yogurt is positioned for expansion in the United States and select international markets. The demand for frozen yogurt and frozen treats continues to grow as consumers pursue healthy eating and lower calorie treat options. Why give up treats when there are delicious low calorie & low fat options? With 3 locations open Internationally in Turkey, Sincerely Yogurt is well on its way in expanding across the globe. Follow us on Facebook for details of our grand opening events. We strive to support our franchisees in whatever we can to drive success. At Sincerely Yogurt we will always be close by. Marketing strategies are developed on a store to store basis. Each location is equipped with promotions and campaigns that maximize each store’s relationship with the community. What is my total estimated cost to open a franchise? Total costs can range from $166,150 to $326,100. There are many variables in these estimates: some are under the franchisee’s control, and some are not. The most significant variable is the leasehold improvements on the location. Will I be required to manage the daily operations? Sincerely Yogurt can be operated as an investment franchise. It combines the financial strength of a franchise investor with the day-to-day operations talent of an Operating Partner. The Operating Partner has an equity position in the business too. What are the financial requirements for ownership? 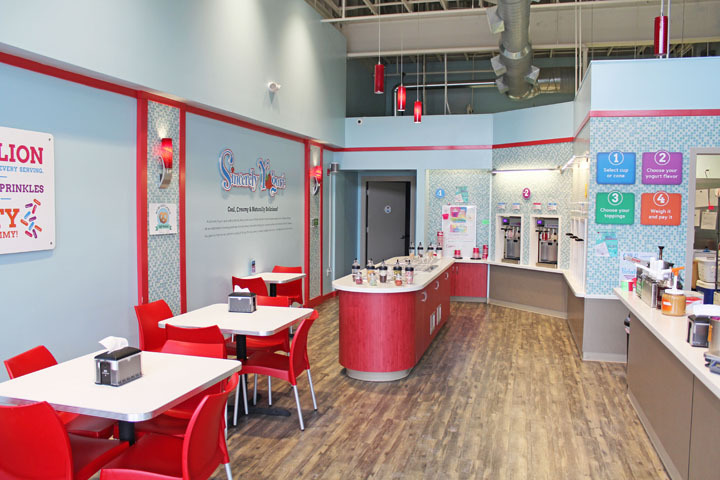 The liquid funds needed to open a Sincerely Yogurt shop are $100,000 and there is a net worth requirement of $250,000. How many employees are needed to operate a Sincerely Yogurt? An advantage of self-service frozen yogurt shops is you do not need many employees. Most shops operate with one or two employees working at the same time. What type of support does the franchise provide? Ablak Holdings has nearly 30 years of experience in managing franchise businesses. Ablak's leadership team is dedicated to understanding market trends to keep the product offerings fresh and appealing to today’s customers. Dedication, team work and communication are critical to growing the brand in markets across the country. Are you ready to begin the discovery process? Please complete our online Franchise Application.